Strictly Vinyl is celebrating 4 years in Maastricht! From the beginnings in the basement of De Kadans in Kesselskade back in 2010 to our second year in the old Muziekgieterij in Bankastraat and various secret events and after parties, we are glad to call the new Muziekgieterij in the Boschstraat our home. 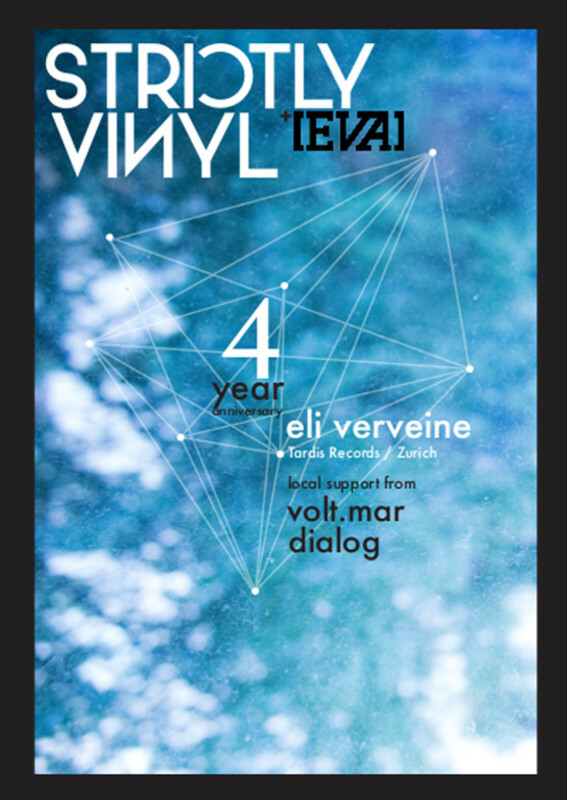 To celebrate 4 years of Strictly Vinyl in Maastricht, we invited a very special guest, Eli Verveine from Zurich, Switzerland. Having regularly played at her hometown’s legendary Dachkantine and Radio Lora, she is now travelling all over the globe to play at renowned clubs such as Panorama Bar and Club der Visionäre in Berlin, Zukunft in Zurich, Concrete in Paris, and Trädgården in Stockholm. Besides her busy touring schedule, Eli is also running Tardis Records with Oscar Schubaq. Don’t miss to celebrate 4 years of vinyl only trips into techno and house in Maastricht. Warm up comes from our residents volt.mar and dialog, and [EVA] is taking care of decoration and art installations!